Federal and state regulations govern pesticid e use in the United States. The United States Environmental Protection Agency (EPA) revised the 1992 Agricultural Worker Protection Standard (WPS) regulation on November 2, 2015 to increase protection from pesticide exposure for the nation’s two million agricultural workers and their families. These changes will afford farmworkers similar health protections that are already afforded to workers in other industries while taking into account the unique working environment of many agricultural jobs. 40 CFR 170. Revisions to the Agricultural Protection Standard (PDF). November 2, 2015. EPA. 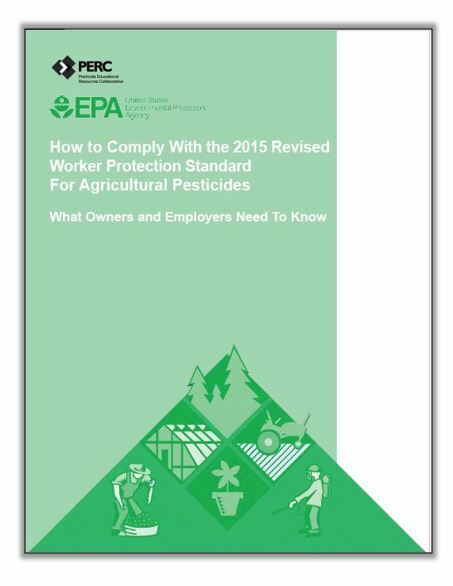 How to Comply With the 2015 Revised Worker Protection Standard For Agricultural Pesticides (PDF). The purpose of this online guide is to help users of agricultural pesticides comply with the requirements of the revised federal Worker Protection Standard. EPA/PERC. Quick Reference Guide to the Worker Protection Standard (WPS) as Revised in 2015 (PDF). This one-page double-sided chart outlines requirements with direct hyperlinks to the text of the regulation for each item being cited in the chart. It is also available in Spanish (PDF). EPA/PERC. Frequently Asked Questions (FAQs) on EPA’s Revised Worker Protection Standard for Agricultural Pesticides (WPS) 40 CFR Part 170 (PDF). 4/14/2016. EPA. EPA Agricultural Worker Protection Standard (WPS) Comparison of the New Protections to the Existing Protections. October 2015; English (PDF). December 2015; Spanish (PDF). US EPA. The New Jersey Department of Environmental Protection (NJ DEP) regulations [NJAC 7:30 Subchapter 12] provide New Jersey’s regulations for Worker Protection. Prior to EPA’s revision of the WPS in 2015, New Jersey’s Agricultural Worker Protection regulations were more stringent than EPA’s 1992 Worker Protection Standard (as amended). Some of the more stringent New Jersey regulations included: worker and handler training recordkeeping; annual “refresher” training; and additional information required to be posted in the Central Posting Area. EPA’s 2015 revision of the WPS now includes many of the requirements of New Jersey’s existing regulations. Revised Federal regulations will take primacy when New Jersey Department of Environmental Protection regulations are less stringent. It is likely that these New Jersey regulations will eventually be revised for parity. However, there are instances where the two rules differ and require interpretation. Interim guidance for the public for instances where the two rules differ is pending from NJDEP; check their Worker Protection website for more details on this. For specific questions or concerns about NJDEP’s implementation of the revised WPS, please contact Nancy Santiago at 609-984-6568 or email Nancy at: pcp@dep.nj.gov. EPA Region 10 produced the Overview of Revised Worker Protection Standard Compliance Requirements (PDF). This overview of compliance requirements of the Revised WPS regulations provides the key changes of the rule. Although it provides much detail; it does not address all requirements. For complete information, go to www.epa.gov/pesticide-worker-safety. Worker training grace period is eliminated. Workers must be trained before* they work in an area where a pesticide has been used or a restricted-entry interval has been in effect in the past 30 days. Trainers must be certified applicators or have completed an EPA-approved train-the-trainer program or be designated by the State or Tribal pesticide enforcement agency. Train-the-trainer programs and training materials must be EPA-approved. Employers must keep training records for two years** (New Jersey: five years) years and give a copy to workers and handlers upon request. *In addition to annual pesticide safety training, worker and handler orientation is still required in New Jersey (for each agricultural establishment employed). New Jersey regulations require that workers receive orientation once a year; on their first day of employment; or at least one day prior to any work in a field where an REI has been in effect in the last 30 days. New Jersey regulations require that handlers receive employee orientation once a year; on the first day of their employment; or at least one day prior to performance of a handler task. However, the NJDEP Worker Protection Unit has provided that use of the NJDEP pamphlets “Protect Yourself from Pesticides” is now optional. **New Jersey regulations currently require that trainers maintain training rosters for 5 years. New Jersey regulations currently require that trainers distribute EPA Training Verification Cards to worker and handler trainees, and record the card number on the DEP-required training rosters. However, the NJDEP Worker Protection Unit has provided that the cards will no longer be distributed, nor recognized as verification of WPS-required training. The NJDEP Worker Protection Unit has provided that training rosters will be used as verification of training. Worker and handler WPS training rosters must still be immediately available upon request. See DEP’s Worker Protection website for specific State requirements for training, recordkeeping, and NJDEP trainer “acknowledgement”. See specific language of the New Jersey regulations: Worker pesticide safety training [NJAC 7:30-12.8]; and Pesticide safety training for handlers [NJAC 7:30-12.16]. Employers must display application information and safety data sheets (SDS) at a central location within 24* hours of end of application (New Jersey: before application begins) and before workers enter that treated area. Display both for 30 days after REI expires. Keep records of application information and SDS for two** years from end of REI and make available to workers, handlers, designated representatives (identified in writing) or medical personnel upon request. *NJDEP has provided that application information currently required per NJAC 7:30-12.14, as well as SDS must be displayed. There is no change for New Jersey agricultural employers regarding when the information must be displayed. This information will still be required to be displayed prior to application, rather than EPA’s requirement of within 24 hours after the application has ended. **New Jersey regulations currently require that application records be retained by private or commercial applicators for 3 years. However, DEP has provided that applicators and ag employers will now be expected to maintain both application records and SDS for 3 years. This is more stringent than the Revised WPS, as well as current NJAC 7:30 regulations. See related excerpts of current New Jersey regulations at: [NJAC 7:30-12.6 and 12.9] Providing specific information about applications and posted pesticide safety information at a central display area for workers and [NJAC 7:30-12.14 and NJAC 7:30-12.19] for handlers; [NJAC 7:30-8.8] Private Pesticide Applicators Records; and [NJAC 7:30-6.8] Commercial Pesticide Applicators Records. Display pesticide safety information at a central location and at sites where decontamination supplies are located, if the decontamination supplies are at a permanent site or at a location with 11 or more workers. Post warning sign if REI is greater than 48 hours (outdoor applications) or 4 hours (enclosed space applications), otherwise option for posting or oral notification unless label requires both (“double notification)”. Agricultural employer must provide information to a commercial pesticide handler employer on treated areas the commercial handler may be in (or walk within ¼ mile of). Commercial pesticide handler employer must provide application-related information to agricultural employer before the application begins and provide updates for certain changes before the application and within 2 hours of end of application for most other changes, unless only change was less than 1-hour difference in application time. REI exception and notification requirements for early-entry workers: Notify early-entry workers of application specifics, tasks to be performed, conditions of the early-entry exception, and hazard information from the pesticide label. Respirators – Employer must provide respirator and fit testing, training, and medical evaluation that conforms to OSHA standards for any handler required to wear any respirator by the labeling. Require recordkeeping of completion of fit test, training, and medical evaluation. PPE exception for closed systems – Exceptions to labeling-specified PPE allowed for handlers when using closed systems. A closed system must meet a broad performance-based standard and basic operating standards (written operating instructions and training of handlers in use of the system) must be provided. PPE exception for crop advisors and their employees – Crop advisors and their employees entering treated areas while a REI is in effect to conduct crop-advisor tasks may wear a standard set of PPE (coveralls, shoes plus socks and chemical-resistant gloves made of any waterproof material, and eye protection if the labeling of the pesticide product applied requires protective eyewear for handlers, as outlined in rule), OR the PPE specified on the pesticide labeling for early-entry activities instead of the PPE specified on the pesticide labeling for handling activities, provided certain conditions are met. PPE exception from eyewear for pilots in open cockpits – If product label requires eye protection, pilots in open cockpits may wear a helmet with lowered face shield instead of label-required eye protection. PPE exception for enclosed cabs – Maintain exception for dermal PPE as in existing rule with same conditions, but handlers in enclosed cabs must wear the labeling-specified respiratory protection except when the only labeling-specified respiratory protection is a particulate filtering face piece respirator (NIOSH approval number prefix TC-84A), previously called a dust/mist filtering respirator. Quantity of water – Provide 1 gallon for each worker and 3 gallons for each handler and each early entry worker as measured at beginning of workers’ or handlers’ work period. Use of natural waters – There is no reference to, or prohibition from, using natural waters in addition to decontamination water provided. Workers and handlers are trained to use any nearest clean water source in case of emergency. Eye wash for handlers – Provide a system capable of delivering 0.4 gallons/minute for 15 minutes, or 6 gallons of water able to flow gently for about 15 minutes at a mix/load site if handlers use products requiring eye protection or use a pressurized closed system. One pint of water in a portable container must be available to each handler applying pesticides if eye protection is required. Provide prompt transportation to medical facility. Promptly provide the Safety Data Sheet (SDS); product information (name, EPA Reg. No., active ingredient); and circumstances of exposure to treating medical personnel. *See New Jersey’s current regulations on emergency assistance 7:30-12.11. It also requires that the antidote, first aid, and other medical information from the product labeling be provided that person or any treating medical personnel. Immediate Family – Includes stepparents/children; foster parents/children; most in-laws (parents, children, siblings), grandparents, grandchildren, aunts, uncles, nieces, nephews, and first cousins. Enclosed space production – Indoors or in a structure or space that is covered in whole or in part by any nonporous covering and that is large enough to permit a person to enter. Employ – To obtain, directly or through a labor contractor, the services of a person in exchange for a salary or wages, including piece-rate wages, without regard to who may pay or who may receive the salary or wages. It includes obtaining the services of a self-employed person, an independent contractor, or a person compensated by a third party. Expand existing training content for workers and handlers. Worker training topics expanded to 23 items, and handler training expanded to 36 items. Training on new content required within 180 days of EPA’s notice of availability of training materials, but no earlier than January 2018. In addition to handlers applying pesticides so as not to contact workers or other persons, handlers must suspend an application if a worker or other person is in the application exclusion zone, an area up to 100 feet around the application equipment. *This overview of the changes to the WPS regulation does not review all requirements. For complete information on the Federal Rule, go to EPA’s Worker Safety website. Source: http://pesticideresources.org/wps/hosted/compliance-requirement-schedule.pdf. Date accessed 2/6/2017.